(CBS) THURSTON, Md. 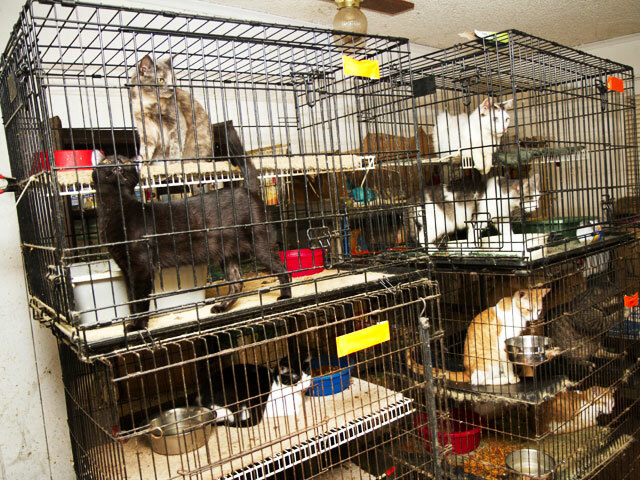 - Animal control officers found 68 dead cats in plastic bags, coolers and shallow graves at the home of a Frederick County woman earlier this month, reports CBS station WJZ in Baltimore. Officers took the 89 living cats they found on the property to a local vet where some had to be euthanized. The rest are being assessed in the hopes that they can be adopted. Neighbors say they were aware of the homeowner's penchant for animal hoarding. "I think everyone knows about the smell," a neighbor said. "Anytime that we went by, there was a smell." "When they are in different forms of decomposition, the odor is tremendous," said Harold Domer of the Frederick County Animal Control. "When we served the warrant on that Tuesday, we had a device that measured the ammonia smell and it was over 300 particles per million. That does require a gas masks." The homeowner now faces a number of charges, among them animal neglect. She could serve up to 90 days in jail and receive a $1,000 fine for each count. "Not providing the necessary vet care and air for the animals because of the high ammonia smell and content," Domer said. But some neighbors say the home owner has been saving the lives of unwanted cats. "Everybody knows around here, if you've got a cat you don't want, you throw it in her yard, it's going to be alright," Brent Geouge said. "Because if you take it to the animal shelter, they're going to kill it."